"The Hotel Del Clos won a 2016 Trip Advisor Traveller's Choice award based on the reviews given by the travel community. This award recognises the hotel's outstanding service and all the fantastic feedback it recieves from guests." As part of the Mountain Collection, Hotel Del Clos offers free ski guiding and coaching with fully qualified Mountain Expert ski and snowboard instructors. Various sessions run throughout the week to introduce you to the ski area and improve your technique along the way. Skiers and snowboarders wishing to take part need to be over 18 (or 12 in school holidays) and be good enough to ski down blue and red pistes. You can sign up for the sessions at the hotel on your first day in resort. 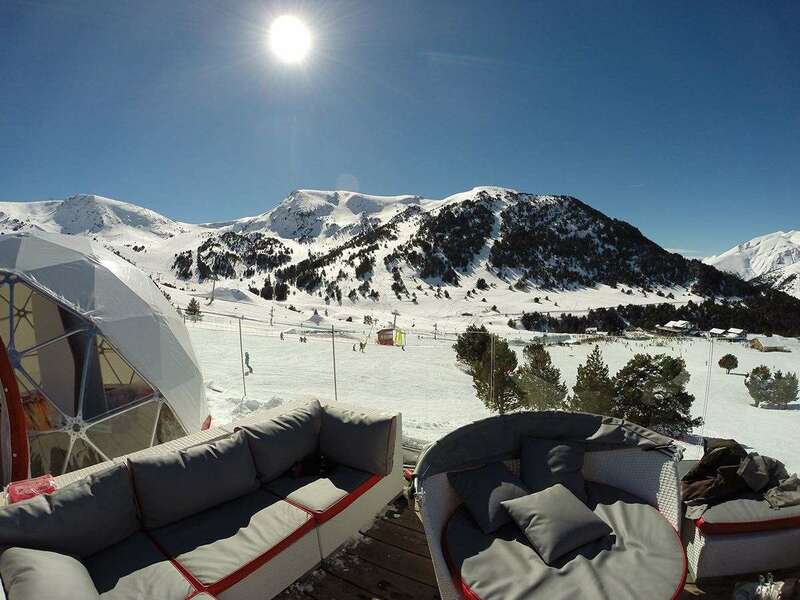 With a fabulous location near the slopes, inviting après bar and large south-facing sun terrace with superb views over El Tarter’s slopes, it’s a superb snow hotel. The hotel is decorated with beautifully carved wood and stone and facilities include a snug lounge with comfy seating and large log fire.. For our younger guests, there are three children’s club rooms, games & TV room, snow garden and slopeside kid’s chalet to ensure the children are as well cared for. The bedrooms are spacious and well equipped and are a mix of twin, triple and quad rooms that feature bunk beds big enough for adults, and thanks to the hotel’s slightly elevated position, most rooms have spectacular mountain views too. There’s also a treatment room (sports massage and therapies) and a brand new ski storage area with toasty boot warmers. A large range of treatments are planned in our wellness area, such as sports, deep tissue & hot stone massage, Japanese Reiki, Indian head massage and beauty treatments using Temple Spa products. Number of rooms: 53 All are spacious and comfortably furnished with deep mattresses, flatscreen TV’s and a fully ensuite bathroom with hairdryer, bath & shower attachment. Many have views of El Tarter’s slopes and some have a balcony or terrace at a supplement. Rooms (2-3 people): Twin and triple rooms, some with a balcony or terrace have two or three single beds and side views across the village. Mountain view rooms, rooms with a balcony or terrace and rooms for sole use available. Larger rooms (2-4 people): These very large rooms have twin beds and built-in wooden bunk beds suitable for adults or children, separated from the main bedroom either by a partition or door. Most rooms have a balcony or terrace. Deluxe quad room (2-4 people): This unique deluxe quad room has two bedrooms; one has twin beds and the other has bunk beds in a small room off the hallway. There is also a large terrace offering mountain views. Very friendly helpful staff and everything thought through to help you relax and concentrate on the skiing. Accomodation spotless and of a high standard. Breakfast, high tea and dinner of an excellent standard and quantity for hungry skiers - all freshly cooked with quality ingredients. Can&#39;t fault it..... hopefully will go back. We have just had a wonderful week at the Hotel Del Clos. This hotel is homely and family friendly, so we could all relax! The food was plentiful and tasty. All the staff are friendly and pleasant- thanks George in the restaurant! 5 minute downhill walk to chairlift. We stored our skis near the lift. I will definitely return. The manager is wonderful and this is reflected in a well run hotel. Family rooms are perfect with a divided area for kids bunk beds. Lots of hot water after a hard day skiing. Lots of things for the kids to do in the evening: pool, table tennis, darts, cards.